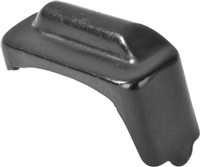 Garand En-Bloc clip holds 8 rounds and fits inside the rifle. For use in M1 Garands and clones. Once the clip has been emptied, it automatically ejects from the rifle and they can be reused time and time again. M1 CARBINE SAFETY SWITCH MARKED H.T. M1 Safety Switch marked with a H.T. M1 trigger housing NOT marked. This is a stripped trigger housing. M1 CARBINE SLIDE MARKED T IN "DROP IN CONDITION". M1 trigger housing marked with a W for Winchester. This is a fully functioning trigger housing in "drop in" condition". M1 trigger housing marked with a Q-NL for Quality HMC. This is a fully functioning trigger housing in "drop in" condition". M1 trigger housing marked with a SG for Saginaw. This is a fully functioning trigger housing in "drop in" condition".